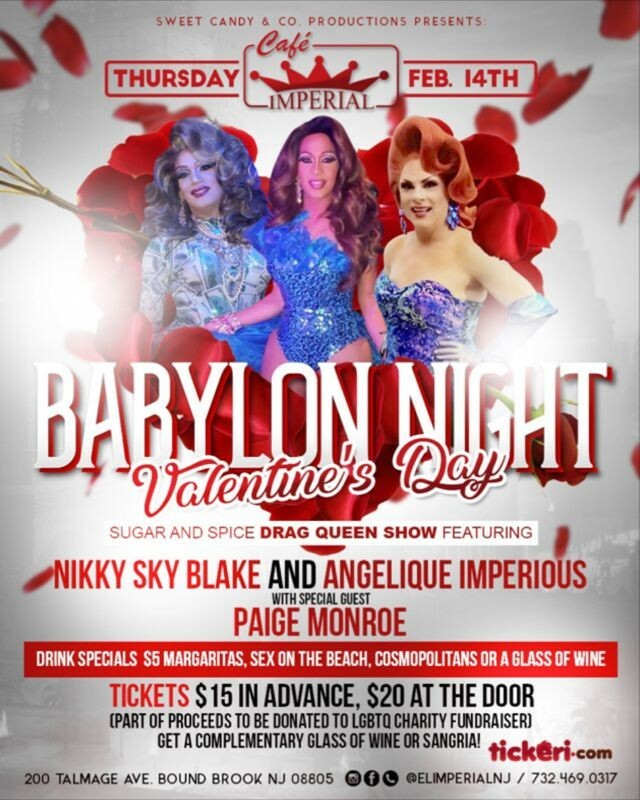 On Valentine's Day we have Our Sugar and Spice Drag Show featuring Nikky Sky Blake (Our Sugar) and Angelique Imperious (Our Spice) with Special Guest, Paige Monroe (Our Everything Nice) at Cafe Imperial. Music by DJ Victor Alex and DJ Enigma. Tickets are $15.00 in advance and $20.00 at the door, per person. With each ticket purchase you receive a complimentary glass of Wine or Sangria to start your evening. You also get a free entry into our raffle for a very Special Valentine's Day Gift! Free Parking! Delicious Appetizers Menu including The Famous Sushi Aplatanao! *** Take a Look at our VIP Specials and make this a memorable night! VIP Specials are only available with prior Online reservations. If you have any special requests please feel free to contact event promoter, Candy Kegel at 732-595-2260 or click the Email The Promoter link.